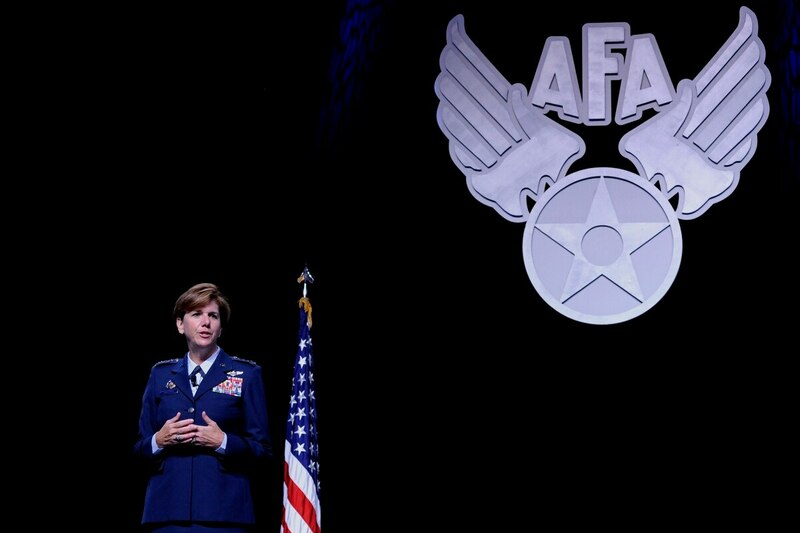 WASHINGTON — Air Force Gen. Lori Robinson is the Obama administration's likely choice as the next head of US Northern Command, sources say, a move which would make her the first woman to lead a combatant command. Rumors have circulated inside the Pentagon for weeks that Robinson is being considered for the role, including a Wall Street Journal report which named her as the likely nominee. Two sources today confirmed the rumors to Defense News, although both warned that with nominations, nothing is locked in until a final decision has been made. Seen as a rising star in the Air Force, Robinson has shot through the ranks, adding a star a year from 2012 through 2014. In June of 2012, just before current Air Force Chief of Staff Gen. Mark Welsh took office, Robinson was a two-star serving as deputy commander, US Air Forces Central Command; less than a year later, she pinned on her third star in May of 2013 and became vice commander, Air Combat Command. Then in October 2014, she pinned on her fourth star and took over as commander, Pacific Air Forces. With the PACAF assignment, Robinson became the first US female four-star to command combat forces. "She's highly capable, highly competent, and she will do a great job," one of the sources said of Robinson. If Robinson takes the NORTHCOM role, it would remove her from the running to replace Welsh later this year. There has been a strong belief both inside and outside the Pentagon that Robinson is a favorite of Air Force Secretary Deborah Lee James, but there were questions about whether Robinson has enough experience to become Chief. The race to replace Welsh appears to be down to three candidates: Gen. Darren McDew, who last year moved from Air Mobility Command to lead US Transportation Command; Gen. Herbert "Hawk" Carlisle, the head of Air Combat Command; and Gen. John Hyten, who leads US Air Force Space Command. McDew has a background flying both the KC-135 tanker and C-17 transport. Although he only recently was assigned to TRANSCOM, the general consensus is that position is not so vital he could not be moved if the administration desired. If nominated, McDew would be the first African-American chief for the service. Carlisle would be the most traditional candidate: a fighter pilot with experience both inside and outside the Pentagon. He has also spent two years as head of Pacific Air Forces, giving him expertise in that region at a time when the "rebalance" to the Pacific remains a major focus of both the Obama administration and Secretary of Defense Ash Carter. Hyten, by contrast, would represent a dramatically nontraditional option. The head of Space Command since August of 2014, Hyten has no piloting experience, often seen as a cultural prerequisite to lead the service. However, Carter has shown a propensity for choosing out of the box nominees in his choice for both Army and Navy leadership, and has emphasized the importance of space and cyber operations in his first year as Secretary. Another point that may interest Carter: Hyten attended Harvard University on an Air Force Reserve Officer Training Corps scholarship. Carter was a professor at Harvard and has shown fondness for Ivy League educations in his picks of Gen. Mark Milley, now Army chief, and Adm. John Richardson, now the Navy head. One of the sources said that if Robinson moves to NORTHCOM, the service may shift Lt. Gen. Mike "Mobile" Holmes, currently Deputy Chief of Staff for Strategic Plans and Requirements, to fill the spot.